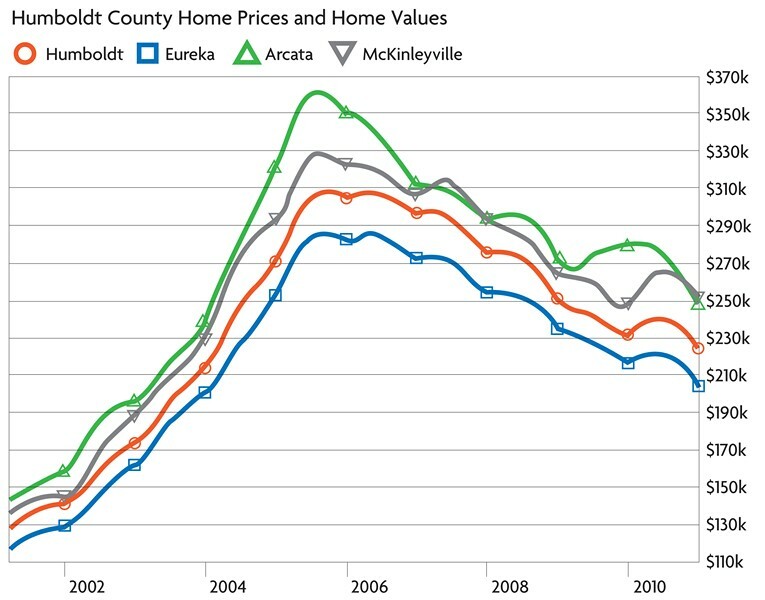 The nation's housing bubble, which evidently is still deflating, should also have deflated a stalwart local myth -- that Humboldt County's housing market is immune from the violent ups and downs of the larger marketplace. It's not. Granted, our bubble wasn't as distended as those in Phoenix and Las Vegas, and thus the resulting fallout hasn't been as ugly. But make no mistake: We rode the bubble, too. At its local peak, in March 2006, the monthly payment on a median-priced Humboldt County home (including principal, interest, taxes and insurance) was a whopping $2,137. Only one in 10 local residents could have qualified for a traditional loan on such a house. By January of this year (the most recent stats available), the monthly payment on a median-priced county home had fallen nearly 40 percent, thanks in part to lower interest rates, to $1,294. Almost three times as many residents could now afford to finance such a house -- and that's still fewer than the historic norm. What do these tea leaves say about the future? Rob Arkley, among others, predicts that the country's lagging residential real estate sales will continue to plummet for at least a year, dragging prices down with them. (See From the Publisher in this editon.) Curiously, this prognostication runs counter to the trend here in Humboldt County, where houses are suddenly selling like hotcakes. In the latest issue of the Humboldt Economic Index, HSU Professor Erick Eschker notes that home sales rose 35 percent in December and another 34 percent in February to reach their highest value since July 2007. Local Realtors, no doubt, are smiling once again. But let's not forget the lessons of the past: If we really want to see where the local housing market is headed, we'd do well to see which way the wind is blowing beyond the Redwood Curtain. The latest reports are less than sunny. After several months of increases, existing home sales fell sharply last month, dropping 9.6 percent from January's mark to an annual rate of 4.88 million units, according to the National Association of Realtors. New home sales have also plummeted this year by more than 11 percent. And as the long wave of foreclosures continues to flood the market with excess supply, home prices keep tumbling. They've now reached a nine-year low, according to the NAR. The Federal Housing Finance Agency has deemed this the worst housing market crash in seven decades. When will it end? There are plenty of indicators, both nationally and locally, that the larger economy is improving. Nationally, the economy added 192,000 jobs in February, mostly in the private sector. And locally, not only has the housing market improved but we also saw big increases in hospitality and manufacturing last month. On the other hand, have you seen gas prices lately? As Eschker says in the Index, the price at the pump could stymie a potential turnaround. Ultimately, he says, there's only one constant: "As always, the outlook is uncertain."